Togekiss in game: 784 Who? Important notice! Pokemon Togekiss is a fictional character of humans. 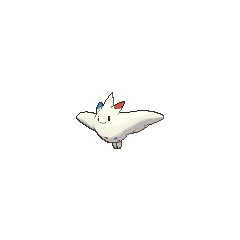 Togekiss (Japanese: ????? Togekiss) is a dual-type Fairy/Flying Pokémon introduced in Generation IV. Prior to Generation VI, it was a dual-type Normal/Flying Pokémon. 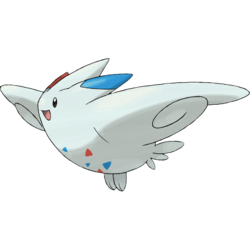 Togekiss is a white, avian Pokémon with an ovoid body. While its feet are small and situated closely together, its wings are broad and triangular. Red and blue triangular markings over its underside, and it has a short tail consisting of three feathers. On the back of its head are three spikes: a red tipped on the right, a blue tipped one on the left, and a pure white one in the middle. 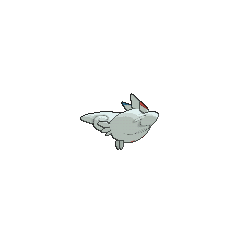 Togekiss has a relatively flat face and small, black eyes. This Pokémon is rarely seen, only appearing in peaceful areas. When it is seen or visits respectful people, it showers gifts of blessings and kindness. 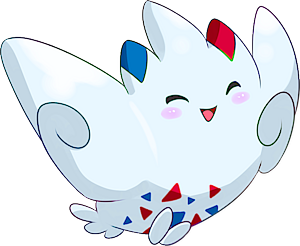 Togekiss made its anime debut in Dawn of a Royal Day!, under the ownership of Princess Salvia. Salvia later gave the Togekiss to Dawn as a gift. Togekiss makes a cameo at the beginning of the movie Giratina and the Sky Warrior. Gold's Togebo evolves into a Togekiss immediately after evolving into a Togetic in the HeartGold & SoulSilver chapter. Arcade Star Dahlia is shown to own a Togekiss. Platinum is forced to use it when both Trainers switch their Pokémon due the Battle Arcade's Pokémon Swap. Togekiss learns the most moves that never miss regardless of the user's accuracy or the foe's evasiveness: Aura Sphere, Shock Wave, Swift, Aerial Ace, Magical Leaf, and Smart Strike. 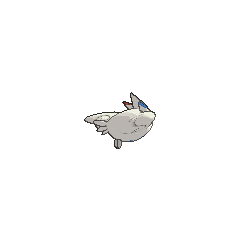 Togekiss's weight is equal to that of Lucas, as well as four other Pokémon; Sudowoodo, Skuntank, Fearow, and Yanma. Togekiss is also the same height as Ethan. As of Generation VI, no other Pokémon have same dual Egg Group as Togekiss and its pre-evolution. In this case, both in Flying and Fairy are unique. As of Generation VI, no other Pokémon have the same type combination as Togekiss and its pre-evolution. 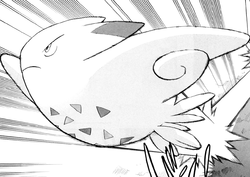 Togekiss's design appears to draw inspiration from fairies and birds. Its association with peace and joy, as well as its white coloration, suggests inspiration from doves, but its soaring flight and some physical aspects are similar to those of large birds of prey. 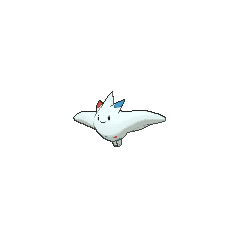 Togekiss may have also been designed to resemble a flying wing. Togekiss is a combination of ? toge (spike) and kiss.